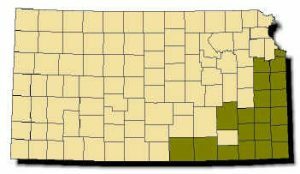 Range: Restricted to the eastern third of Kansas; generally found no farther west than the eastern edge of the Flint Hills. Description: Harmless. Named for the weakly keeled, bright green scales covering its body. A slender-bodied, serpent with a white or cream-colored belly. 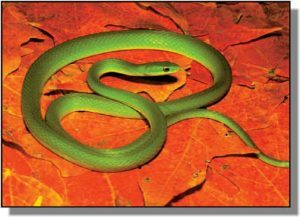 Tail is very long, almost 40% of total body length; tail is used as an anchor when snake is moving through branches of bushes and brush. Young are miniature adults. Habits: Active during the day from April to early October. Highly arboreal (tree-dwelling); prefers bushes or shrubs along edge of streams and swamps; sometimes found on open brushy ridges. Very difficult to observe because its color blends so well with green vegetation. Breeding occurs in spring or autumn; up to 10 eggs per clutch are laid in June or July. Specializes in feeding on caterpillars, grasshoppers, crickets, dragonflies, damselflies and spiders.